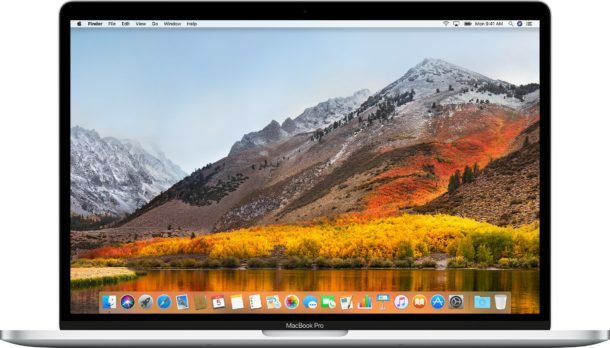 Apple has released macOS High Sierra 10.13.4 for Mac users who are running High Sierra on their computers. Separately, Security Updates 2018-002 for MacOS Sierra and Mac OS X El Capitan are also available for Mac users running prior system software builds. Additionally, iOS 11.3 update for iPhone and iPad is available to download along with updates to watchOS, tvOS, and HomePod. The macOS High Sierra 10.13.4 release includes various bug fixes and enhancements to MacOS High Sierra and is therefore recommended to install on any Mac currently running the High Sierra system software. The Security Update 2018-002 packages for El Capitan and Sierra are exclusively for security patches and are also recommended to install for any Mac user running those versions of system software. A new version of Safari 11.1 is also available for the earlier MacOS releases. Aside form the inclusion of a new cloud wallpaper, there are not many outward changes to macOS 10.13.4, suggesting the latest High Sierra update is mostly aimed for bug fixes and enhancements. The macOS High Sierra 10.13.4 release does start notifying users when running 32-bit apps however, as Apple moves to eventually discontinue support for running older 32-bit applications in Mac OS. You can see what apps are 32-bit on your Mac with these instructions, otherwise when you open a 32-bit app on a Mac running 10.13.4 or later you will see a notification alerting you to update the app. MacOS 10.13.4 also includes support for external GPU hardware. Full release notes for macOS High Sierra 10.13.4 are included further below. Always back up a Mac with Time Machine or your backup method of choice before beginning any software update. Installing any Mac OS system software update requires the computer to reboot. Installing Security Updates also usually requires a system reboot. An updated version of iTunes 12.7.4 and Safari 11.1 are also available for Mac users as well, though whether or not you find those available will depend on what version of system software and iTunes is in use on the given Mac. Package installers for the macOS 10.13.4 Combo Update, Standard Update, and Security Updates for Mac OS Sierra and El Capitan can be downloaded directly from the Apple Support downloads site here as well. – Adds support for Business Chat conversations in Messages in the U.S.
– Adds support for external graphics processors (eGPUs). – Fixes graphics corruption issues affecting certain apps on iMac Pro. – Allows jumping to the rightmost open tab using Command-9 in Safari. – Enables sorting of Safari bookmarks by name or URL by Control-clicking and choosing Sort By. – Fixes an issue that may prevent web link previews from appearing in Messages. – Helps protect privacy by only AutoFilling usernames and passwords after selecting them in a web form field in Safari. – Displays warnings in the Safari Smart Search field when interacting with password or credit card forms on unencrypted webpages. – Displays privacy icons and links to explain how your data will be used and protected when Apple features ask to use your personal information. – No longer disables User Approved Kernel Extension Loading on MDM-enrolled devices. For devices with DEP-initiated or User Approved MDM enrollment, administrators can use the Kernel Extension Policy payload. – Improves Spotlight search results for files stored on network mounts. – Properly evaluates ACLs on SMB share points. – Adds the –eraseinstall flag to the startosinstall command in the macOS Installer app at Contents/Resources/startosinstall. Use this flag to erase and install macOS on a disk. For details, run startosinstall with the –usage flag. – Updates System Image Utility to allow creating NetInstall images that erase and install macOS to a named target volume. Separately, iPhone and iPad users can download iOS 11.3, while Apple Watch, Apple TV, and HomePod also has software updates available. :-( why such a series of major updates just before a long Easter weekend…? I have a lot of work to do and now I am updating my Mac, iPad’s, iPhones etc. Should have been delayed until somewhere next week. Not well thought over at all. The updates are available today. You are not required to install them today. Next time I have dinner with Timmy Kook, I’ll tell him to check with you first before releasing an update Ron. Does anyone know if installation of 2018-002 will also force the installation of 2018-001 (CPU out-of-order cache security fixes)? -001 breaks my system, and I had to restore from TimeMachine when I tried installing it. I know, El Cap is not officially supported on a MacPro 2,1, but that security update is the only problem I’ve run into because it isn’t needed on Core 2-based Xeons; it just KPs at boot. No sign of the 10.13.4 combo yet. I’m sure it’ll be along soon. More disturbing for me is that many services currently supported on MacOS Server will be removed this fall. I run a Wiki and website with Server. Looks like I may have to stick with this as my last update. I don’t want to convert to some open source wiki. Hi, when resetting my computer a message appears that installation couldn’t be complete and restarting for trying again. This repeats each time I reset. Does anybody knows how to fix this? Yes, it happened to me. Turn off your Mac, start with the Option key held down. Click on the MacOS startup drive up arrow. If the arrow is under “installer” move it with the arrow keys. Your Mac should now boot properly but without the 10.13.4 update. You can now try it again if you want. If it still does not boot, it’s screwed. Reinstall High Sierra and fire a nasty email to Apple for them to ignore. Yep. Installed. Same error as you guys above. Reinstalling the OS now. And I’ve a tonne of work to do. FFS! DO NOT DO THIS OS UPDATE!! It totally screwed up my 2.5Ghz i5 Macbookpro, nothing would launch, got the spinning color wheel of death on every application, and would not shut down, just froze. I restored from my clone backup, and all is fine now. Obviously Apple dropped the bomb on this, I got calls from several friends and peers having the same issue. DO NOT UPDATE YOUR OSX!!!!!!!!!!! For anyone who has had a failure of installing macOS High Sierra 10.13.4 Update or the installation could not complete error, try rebooting into Safe Mode and then using the Combo Update package installer from Apple. That will often fix the installation errors of macOS updates. Or you can roll back from a backup like you did, but that is a hassle too. macOS High Sierra continues to amaze me in that people continue to have problems with it, there are so many security flaws, plain text passwords, crashing bugs, incompatibility bugs, problems with networking, problems with external screens, monitor and display issues, graphic issues, and it’s still a mess. It should have never shipped. High Sierra is basically Mac OS Vista. I personally run macOS Low Sierra (10.12.6) and it works great, I will never install High Sierra at any version or for any reason. I hope 10.14 is much better……. After three tries my SSD was no longer there. Even when now booting from a stick. Sigh! Get back on the meds. STAT! It’s not a “simple update” it is a FLAWED update. Check the other posts, you will see many, many others here and other sites are having issues with it as well. Then you can work on getting that foot our of your mouth. Apple screwed up. It’s the security portion and it happens with both High Sierra and Sierra. 10.13.4 is rendering some dua/extended displays inoperable. Recommending that if this is your main work mode, to wait out until the next patch update. Just updated to 10.13.4 and the XCode update is stuck. In Launchpad it’s showing as a paused download, in the Purchased section of the App Store it is listed but the button is a dark grey rectangle with no text. The rest of the screen shows the message “You must sign in to view your purchases.” but clicking on the “sign in” link does nothing. The Updates section in the App Store just shows a white screen. This is not the quality I’ve come to expect from Apple. Just to add, I went into the Featured section of App Store, searched for XCode and was able to restart the update from there. And after much waiting, the XCode installation has completed and App Store appears to be working correctly again. Another “High Sierra” release with a problem? Is anyone surprised? Personally I would recommend upgrading to macOS Sierra 10.12.6, it is stable and works great. Or El Capitan 10.11.6 is reasonably decent too. I have no idea why anyone uses macOS 10.13 High Sierra, it performs like a permanent early beta and every update seems to have at least one major problem associated with it. Who has time for that? Stupid update has ruined my macbook pro. Can’t access my harddrive anymore. It shows in disktool, but when I go to delete and reinstall High Sierra the hd does not show. Got no startdisk in the install menu. I’ve experienced an issue with my File Vault encrypted iMac when it wakes from sleep. The account login displays with an orange checkmark, but the password does not allow me to login. My only option is to power off the iMac and reboot. Disabling File Vault fixes the issue. I just updated my iMac and now cannot access App Store or anything with internet. An error pops up and says the connection is not private? All are safe websites, the update must have changed something? I didn’t do the backup so I’m stuck with this! Help! The latest mac os update has slowed my imac down.